Is it time for your next oil change? Don’t wait, get your Nissan vehicle’s oil changed by the experts at Power Nissan of Salem in Salem, Oregon. Unlike at generic oil change locations, you can count on expert Nissan technicians when you get your oil changed at your local Nissan dealership. Plus, our Nissan mechanics use only genuine OEM Nissan parts and accessories whenever we service your Nissan vehicle, including manufacturer recommended oils and air filters. Every time you bring your Nissan vehicle for a service appointment, our Nissan service technicians will keep an eye out for any future problems to catch them before they become a major issue. Make an appointment for a Nissan oil change today. Power Nissan of Salem is the ideal place to bring your Nissan Altima, Nissan Leaf, or Nissan Pathfinder in for an oil change. As a certified Nissan dealer and service center, you can count on the expertise of our Nissan service technicians, as well as trust in the quality of the Nissan parts we use in all of our repairs. Bring your Nissan vehicle in for an oil change every 3,000 to 5,000 miles, to keep it running at peak performance. Give us a call today to schedule an appointment! 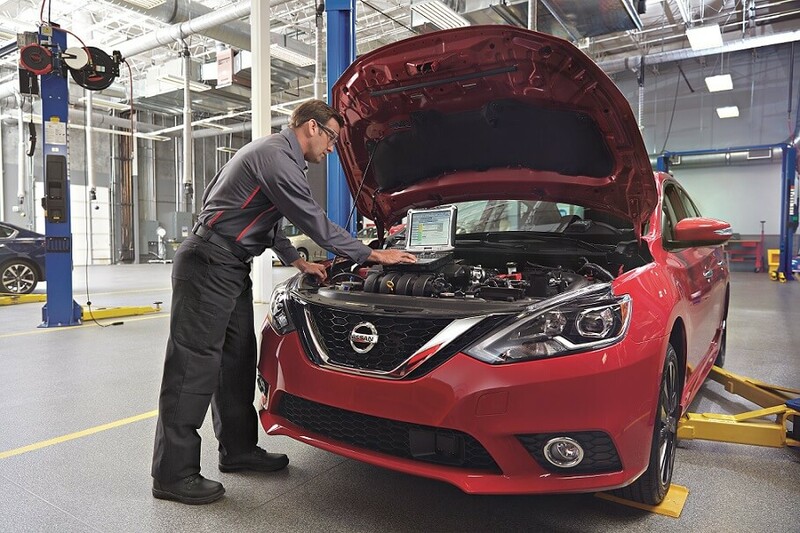 The Nissan auto shop at Power Nissan of Salem provides a complete range of other maintenance and repair services to Nissan drivers in Salem, OR. Make an appointment to have your front end aligned, tires rotated, brakes checked, and fluids flushed. We will be happy to diagnose your check engine light or even take a look at more complicated repair work, too. Get in touch with the Nissan service center at Power Nissan of Salem to schedule a service appointment for your Nissan vehicle today.